CONCORD (Consolidated Cooperation and Relations Command) is an international assembly of regulating bodies founded over a century ago, not long after the five empires had established contact with each other. Relations between the five were strained right from the beginning, and one of the primary aims of CONCORD was to ease the pervasive tension and create a foundation for the empires to work their differences out peacefully. The organization is branched into numerous divisions, each of which handles a certain aspect of the empires’ relations. Of these divisions the CAD (Commerce Assessment Department), which oversees interstellar trade agreements and regulations, and the DED (Directive Enforcement Department), which oversees policing in space, are by far the largest and most influential. Most spacefarers will only ever deal with these two departments on any regular basis; to millions of people, these two represent the actual face of CONCORD. The inner workings of CONCORD are democratic in nature, with each of the five empires technically possessing equal say in all matters (though a nation’s actual pull more often than not will come down to the persuasiveness of its representatives on the debating floor). Early on, the Amarrians were adamant that the Minmatar Republic would not gain admission to the assembly, but they later reluctantly agreed. For the first few years of its existence, CONCORD wielded limited power. The fledgling organization had little diplomatic sway, and regulation enforcement would time and time again prove difficult for its agents. It was not until 18 years after its founding that CONCORD gained the respect of the international community. After the battle of Iyen-Oursta – the bloodiest and most costly engagement the Gallente-Caldari War had seen in decades – both sides were tired of fighting, though long-entrenched hatred and pride prevented either side from asking for a ceasefire. CONCORD took the initiative, and in just under six months managed to negotiate a peace accord between these two bitter enemies, one that would endure for almost a century. In the last two decades the organization’s authority increased further, particularly as interstellar trade grew into the cornerstone of New Eden’s economy that it is today. 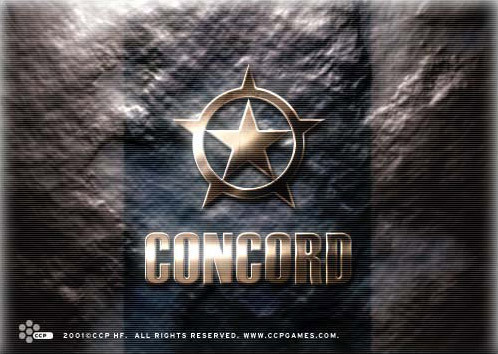 The growing power of CONCORD often raised concern within the empires that the organization could begin to exercise leverage in areas up until then regarded as the nations’ internal affairs. No longer simply a neutral ground for the empires to hammer out diplomatic agreements, CONCORD had become an independent institution that set its own rules and regulations, ones which it was both willing and able to uphold. The organization’s ever-expanding bureaucracy had subtly severed its cords over time, so that it swore fealty to no nation. The only hold the empires had historically possessed over the organization – that of financial support – had in addition been almost completely erased, as revenues garnered through customs, confiscation of illegal goods, license sales and the like were (and still are) more than enough to keep the organization in the black. On several occasions throughout CONCORD’s history relations between the empires deteriorated to within an inch of all-out war but were nursed back to health through the organization’s diplomacy and deterrence. Such was not to be the case in late YC 110, when a fleet belonging to the Minmatar Elders and the Thukker Tribe conducted a strike against the organization’s core communications hub, crippling its rapid response teams and enabling the Elders to mount a large-scale offensive against the Amarr Empire. This marked the beginning of what would become known as the Elder War. CONCORD was back to a semblance of functionality in short order, but the damage was already done; tensions had boiled over into conflict. While CONCORD imposed peace enough to maintain the status quo and keep New Eden from slipping into anarchy, the hostilities already invoked would not be quelled. Using auxiliary forces composed of capsuleer paramilitaries, the nations of New Eden today fight a war under the watchful gaze of CONCORD, which still struggles to rebuild and redefine itself in the blood-red dawn of the Empyrean age. It remains to be seen how – or, indeed, whether – this one-time pillar of New Eden will restore its tarnished reputation.